Chocolate lovers (i'm guessing 95% of the population?) ... this one's for you! 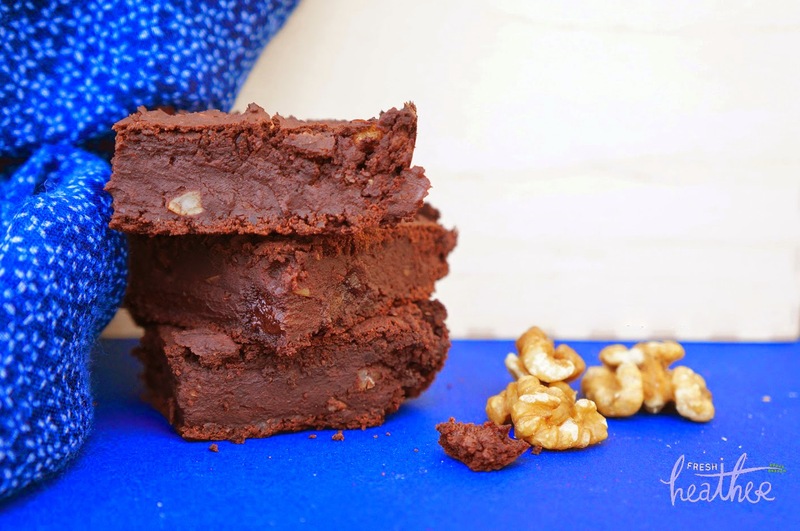 So rich and chocolatey; these brownies are low fat, low sugar, flour-free and good for you (in moderation, of course)! You would never know they were healthy though...managed to trick a few people! Combine all the ingredients (apart from the walnuts) in the food processor and process for around 3 minutes until thick, smooth and creamy. Mix in chopped walnuts and raisins/ chocolate chips if desired. Spread into a greased baking tray and bake in a preheated oven at 350F | 175C for 20-25 minutes, or when the edges begin to come away from the tin and the top of the brownie is cracked. Leave for 10 minutes. Remove from tin and slice! Enjoy! *The amount of sweetener and type of sweetener is completely up to you! I like these rich and chocolatey but if you have more of a sweet tooth, I'd recommend adding up to 1/2 cup honey/agave/brown sugar. Hi! What could I use as a substitute for the beans?